Sorry for the interruption in service, but I’m back, and I have some news. Last week I took a little writing retreat to focus on Surreality revisions. This Monday I finished my final pass of the draft and have sent it along to my copy-editor for his final corrections. This puts the book closer to a release, and I can say with some confidence that you’ll see it before the end of the year. I’m very happy with how this book has come together and can’t wait to share it with all of you. As a little post-revision “treat” I’ve been reading the rough draft, a distance of about seven years and as many drafts (and computers!) from the point I’m at now. Both Surreality and Dark Matter were written without chapters in their first form. The idea behind this was to avoid an artificial structure, and to make the drafts more pliant to being shifted around as necessary. In retrospect, this was a crazy idea. It led to a rambling draft for Dark Matter whose only fix can be a rewrite. Surreality holds up a little better in its first form, and it’s been surprising so far how much I recognize. That said, the need for revisions and the construction of my next mystery have led me to believe that I need to take a more structured and outlined approach. I’ve been saying for months now that the next Surreality book I write will be fully outlined before I put proverbial pen to paper. The idea behind this is to help with the clarity of the mystery from the beginning, to reveal clues at appropriate moments, and keep track of what my characters know at each stage. This goes against my natural instincts. I’ve always been more of a “pantser”, and like the natural flow that comes from just writing, even if it means I have to do a lot of work afterward. Well, my instincts won out, and I now have my first 1000 words of the next book in the Surreality series. I read a short little book called Writing into the Dark by Dean Wesley Smith. Smith attaches a bit more romanticism to the idea of “writing into the dark” than I would typically relate to, but there were a couple of practical suggestions that I fully intend to use with the next book. Outline as you go: This seemed like a no-brainer to me when I heard it. Write a short summary of what happened in the chapter, whose perspective it was from, and where things happened. For me the outline would probably also include any new clues or information about the case (suspects, victims, etc.). Smith places an odd emphasis on clothes, but the point is sound. Authors can have a difficult time holding a whole book in their head, the outline is a quick way to get the info you need without reading whole sections or searching for information. Write in circles: Write 500 words, then go back and revise what you’ve written. Add some, take more away. Fix problems when you think of them, even if this means going back through the whole draft. I’ve been kind of doing this already with The Sky Below, since each chapter goes through several edits before I move on. I think this approach can be tricky for some, you could get stuck in loops fixing the same things over and over. I think to do this successfully you need to have had the confidence to just write large quantities of words without getting stuck. Then you can reign it in to a more controlled and sustainable output. If you’re the type who has a hard time writing each sentence, then this approach might be counterproductive. Be unstuck in time: Zathras would be alarmed. Basically Smith means write the scene your creative voice is inspired to write at the time. If you have to go back and write up to that scene afterward fine. A book does not need to be composed in strictly linear fashion. In a way this both does and does not make sense to me. A natural instinct for a writer is to avoid this approach because if you write a late scene first, what you write earlier in the book may contradict it. But these two problems can probably be fixed with outlining as you go, and fixing problems as you see them. For me I’d say you shouldn’t skip more than few chapters ahead, but that’s a guess. You’re going to write more than you need: Surreality’s first draft was 98,000 words. Now it’s 75,600. We all write down blind alleys, have darlings that need killing, extra words etc. And truthfully of those original 98K, maybe only 30-35K survived to the final draft. Now Smith is trying for an approach that creates only one draft (plus copy-editing I assume). Part of this is because you’ve rewritten everything in the draft several times before moving on. On balance I’d expect most people to go through a couple more revisions, but hopefully fewer rewrites. Basically, don’t use the excuse that this is the rough to write crappy prose, or to ignore research. I agree with this idea in principle, though again I feel like you need to have written several 100,000 words of unfettered fetid prose before an approach like this is attractive or practical. I’m of the school that you have to write as many pages as you are tall before you really get any good, and I’m 6’4″. Writing extra is okay. 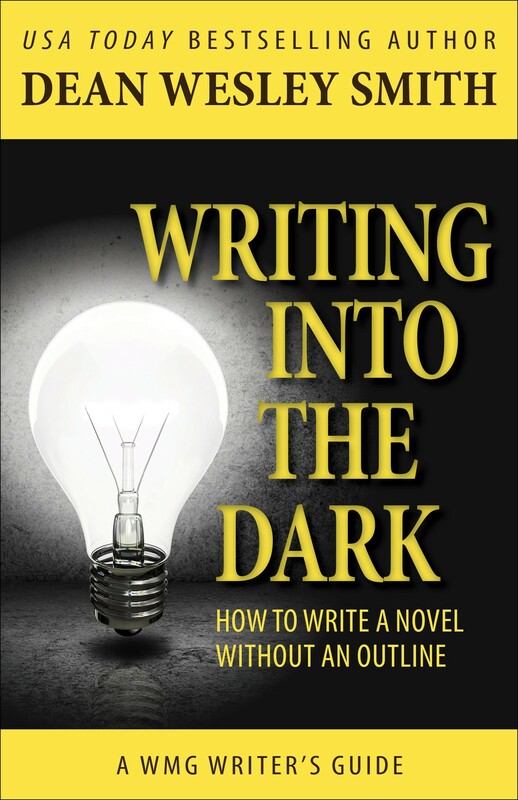 Do you outline or do you “write into the dark” as Wesley Smith so romantically puts it? What works for you?